STORY: Political leaders led by Prime Minister Narendra Modi on Wednesday (August 08) paid tributes to Muthuvel Karunanidhi, five-time chief minister of the country’s Tamil Nadu state and one of the dominant figures in the politics of southern India for half a century, who died at the age of 94. Thousands of supporters lined the streets of India’s southern Chennai city to pay respect to their beloved leader. Along with Modi, Tamil superstar Rajinikanth and Kamal Haasan were among others who laid wreaths and paid tribute. A posse of policemen was seen trying to control the crowd that gathered to mourn his demise at Rajaji Hall, where his body was placed for people to pay their respects. Karunanidhi, who led his party Dravida Munnetra Kazhagam (DMK) for about 50 years, was in hospital since Thursday (July 26) for age-related ailments including urinary tract infections. His death comes less than two years after that of his bitter rival, actress-turned politician Jayaram Jayalalithaa, leaving a political void in the state. 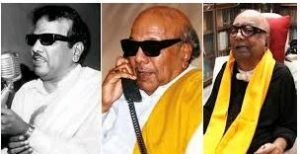 Karunanidhi, who always appeared in public with dark glasses and a yellow shawl draped on a shoulder, built his career fighting oppression by Brahmins, a priestly community at the top of the Hindu caste system .He criticised organised religion and superstition and was known for his sharp wit, command over the Tamil language and populist schemes for those at the bottom of society. Karunanidh will be laid to rest to at the Marina Beach in Chennai later in the day.